In this Mother's Day, we present a portrait of a woman from the ethnic group Hui in China, by Taiwanese artist Chen Shu Fen (陈淑芬), as shown on the postcard US-1869517 to Taiwan. The Hui people (回族) are a predominantly Muslim ethnic group in China, largely concentrated in the Northwestern provinces and the Central Plain along the ancient Silk Road Trading Route. As of 2011 census, there are approximately 10.5 million Hui people, who, while many of them are ethnically similar to Han Chinese, have retained some Arabic, Persian and Central Asian features. The Hui people are one of 56 officially recognized ethnic groups in China. 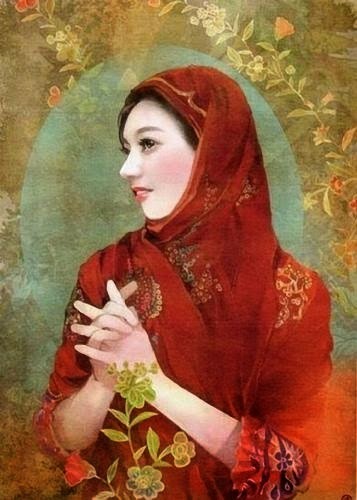 Chen has painted stunning portraits of women from each one of the 56 groups in their traditional dress.